BRUSSELS (Reuters) - Italy's euroskeptic government is pushing for a reduction of tensions between the European Union and Russia but risks isolation in Brussels as EU partners seek instead stronger measures to deter Moscow from interfering in EU affairs. Russia has been subjected to EU sanctions since the 2014 Ukraine crisis and Rome has long urged a relaxation of the penalties on the grounds that they have hit Italian firms trading with Moscow. In a new pro-Russia thrust, Italy is now calling on EU partners to back a plan to channel EU money to small Russian firms that operate in sectors not covered by existing EU sanctions on banking, defense and the energy industry, three diplomats told Reuters. That initiative preceded a two-day summit of EU leaders due to start later on Wednesday in Brussels. Rome is also resisting EU proposals to impose sanctions on countries that carry out cyber-attacks, in another move seen as being in favor of Moscow. Diplomats said the new EU sanctions regime would be aimed mostly at Russia, which has been in recent months at the center of allegations of election meddling via social media in various Western states, as well as cyber warfare and security breaches conducted through electronic means. Italy was the only EU member state that openly resisted the new sanctions regime, according to a confidential EU document seen by Reuters. The diplomatic push in Brussels coincides with a visit by Italy's far-right Deputy Prime Minister Matteo Salvini to Russia on Wednesday, the second since he was sworn in four months ago. "If we are asked to confirm (the sanctions), we will say no," Salvini told a business conference in Moscow. "It's clear that it makes no sense that they are in place." But asked if Italy would veto a renewal, Salvini said: "We can only play the veto joker once in Europe." Polls show the League has multiplied its supporters in recent months also thanks to hardline slogans against the European Union. 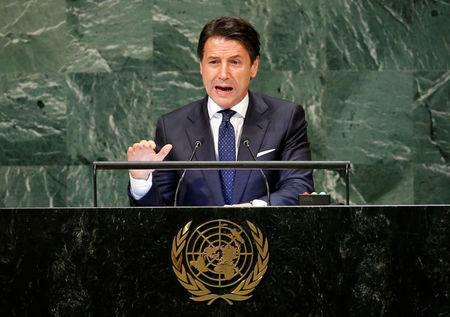 Italian Prime Minister Giuseppe Conte is likely to repeat calls for better relations with Russia at the EU summit. He is then planning to fly to Moscow next week. Rome's calls for EU funding to Russian small firms are not expected to be reflected in the joint document that EU leaders will approve at the end of their meeting this week, diplomats said. But the EU Commission could be asked to explore the feasibility of such a plan. The move is likely to be opposed by Britain and eastern European countries who fear that existing sanctions could be by-passed, one diplomat said. A spokeswoman for the EU foreign affairs chief was not immediately available for comments. Italy's opposition to cyber sanctions has contributed to a softening of the wording of the final joint summit document which in its last draft version says work "should be taken forward" on cyber defenses "through EU restrictive measures". Britain and other backers of the sanctions would have preferred clearer commitments.